Managing a baby’s fever can be difficult and stressful for any parent. Now, with Nurofen for Children’s FeverSmart Temperature Monitor you can alleviate some stress with thank to this continuous and accurate* temperature monitoring device. 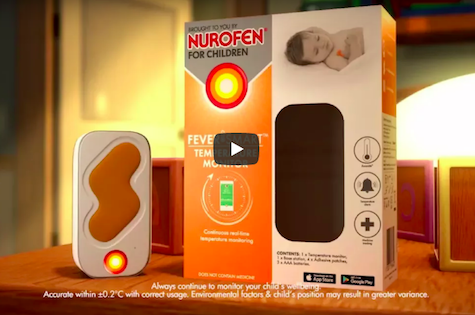 Nurofen for Children’s FeverSmart Temperature Monitor is an innovative new wearable thermometer that enables parents to continuously and accurately* monitor their child’s fever, without disturbing their rest. After a warm-up period, the device transmits a child’s temperature continuously^ to a free app that automatically notifies** parents when their child’s temperature is in the high range. FeverSmart is suitable for children aged 0-3 years old^^ and is discreet and non-invasive, gently attaching underneath the child’s arm. Featuring an adhesive strip crafted using medical grade silicone; the thermometer is gentle on a baby’s skin. The free Digital Temperature Monitoring app is equipped with a host of thoughtfully-designed features from providing useful alerts, enabling parents to easily track their child’s temperature, symptoms and medication. Available now from Chemist Warehouse, Priceline and most other pharmacies. *Accurate within +/- 0. 2ᵒC when used in line with product instructions. Environmental factors and child’s positioning may result in greater variance. ^^Do not use on babies who are premature, of low birth weight or small for gestational age. Important: Use as directed. Parents should always remember to check on their child regularly for other signs or symptoms. Nurofen for Children FeverSmart does not replace continuous parental vigilance.